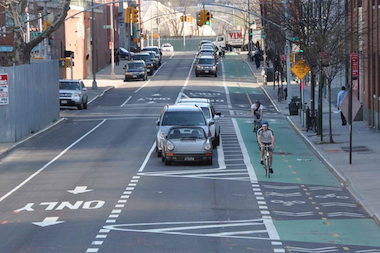 MURRAY HILL — New bike lanes are coming to the East River waterfront, officials announced. The Department of Transportation unveiled plans to add a bike lane along several blocks of the FDR Drive, as well as to add or improve bike lanes on 35, 37th and 38th streets, to ease waterfront access for cyclists and pedestrians, according to Ted Wright, the director of greenways for DOT. The new two-way bike lane along the FDR between 34th and 37th streets will begin closing the gap in the East River Greenway, which currently ends at 35th Street and resumes near 59th Street. The project will add signage and repave the street to make the lane more visible. “As it is now, the path doesn’t look very good and there’s a lack of markings and signage on 37th Street to let cyclists know they can use it,” Wright said. The DOT also wants to install a two-way protected bike lane on First Avenue between 37th and 38th streets, and another one on 37th Street between the FDR and First Avenue. In addition, the DOT is proposing a shared lane for cyclists and cars on 38th Street between First and Second avenues, and another one on 35th Street between the FDR and Second Avenue, Wright said. The proposal is awaiting approval from Community Board 6, which will vote on the project in June. "The goal is to create a greenway network by providing a gateway on 37th Street," Wright said.